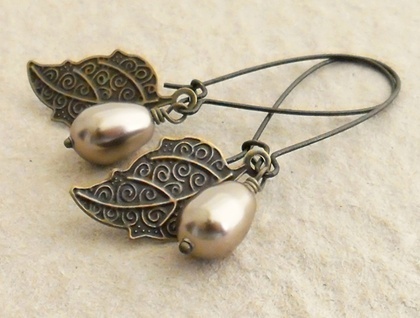 Teardrop-shaped imitation pearls, paired with antiqued-bronze coloured leaves, dangle from elegantly arched, bronze-coloured ear-wires. The leaves are decorated all over with veining patterns and little swirl shapes. Swarovski pearls are made by the makers of the famous Swarovski crystal, and have a crystal core that simulates the weight and feel of a real pearl. They are fade- and perfume-resistant, with a silky smooth, flawless finish; and are generally regarded as the best imitation pearls on the market. 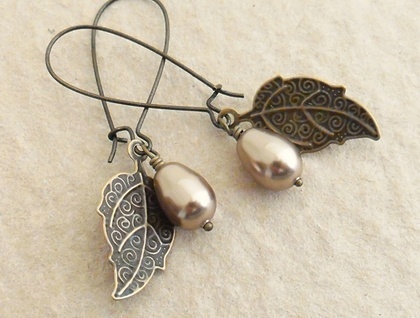 The colour of the pearls used in these earrings is called 'bronze': a soft, metallic beige or fawn with a pinkish tinge. It looks like a deeper, metallic version of the 'powder almond' (pale beige) colour – shown here in the fourth photograph – which is also available from Whiteleaf Jewellery. These earrings are also available in other colours here in my Felt shop. The fourth photograph shows the 'powder almond' (pale beige) version of these earrings hanging. 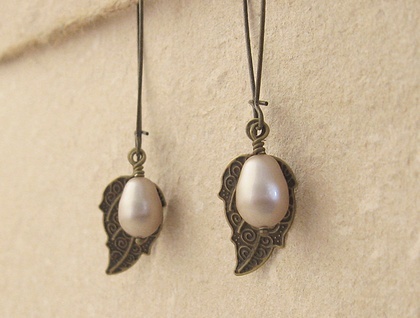 The 'Pearl Berry' earrings measure 56mm from top to bottom. 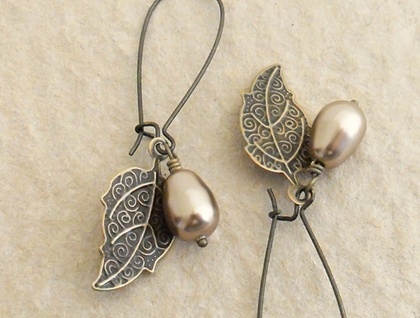 The little leaves are 25mm long, including the baile (hanging loop), and 13mm wide, while the faux pearls are 11mm long, not including the wire-wrapping at their tops. The ear-wires are brass based and are without nickel.